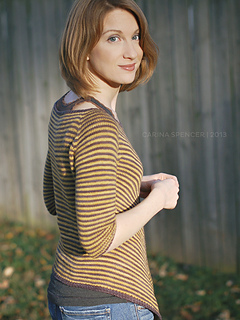 A striped, asymmetrical tee with contrasting ribbed borders and a slipped stitch detail. 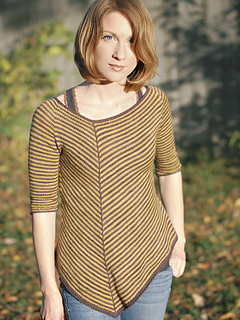 This sweater has a hi-lo, straight back and an a-line, chevron pointed front. 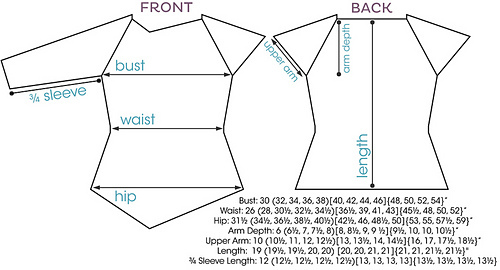 It is knit seamlessly from the top down, minimizing finishing work, and includes directions for cap or ¾ length sleeves. Easy enough for an advanced beginner. Poison Oak is designed for 2 colors stripes with a slipped stitch that carries one color from neck to hem while Sugar Maple is designed for gradient yarns. Poison Oak has two options for sleeve lengths: cap and 3/4. Sugar maple has cap sleeves only. Posion Oak is written for 13 sizes up to a 54” bust and Sugar Maple is written for 9 sizes up to a 46” bust. Because the two patterns are similar, there will be an automatic $3 discount given on the second pattern to anyone who purchases both separately or together at any time - no coupon necessary. single cast on (also known as “backward loop cast-on”) or your preferred method of casting on stitches to the right tip of the needle mid-row. Sample was knit in Malabrigo Sock (100% merino) in Eggplant (MC) and Ochre (CC).